THE FORERUNNER STORY-the history of my people-has been told many times, with greater and greater idealization, until I scarcely recognize it. Some of the ideals are factually true. The Forerunners were sophisticated above all other empires and powerful almost beyond measure. Our ecumene spanned three million fertile worlds. We had achieved the greatest heights of technology and physical knowledge, at least since the time of the Precursors, who, some say, shaped us in their image, and rewarded that image with their breath. The tugging threads of this part of the tale-the first of three-are journey, daring, betrayal, and fate. My fate, the fate of a foolish Forerunner, was joined one night with the fates of two humans and the long world-line of a great military leader . . . that night on which I put in motion the circumstances that triggered the final wave of the hideous Flood. So be this tale told, so be the telling true. THE BOAT'S CREW banked the fires, disengaged the steam engine, and raised the calliope horn from the water. The bubbling clockwork song died out with a series of clicks and sad groans; it hadn't been working well to begin with. Twenty kilometers away, the central peak of Djamonkin Crater rose through blue-gray haze, its tip outlined in ruddy gold by the last of the setting sun. A single brilliant moon rose bright and cold behind our boat. The crater's inland lake rippled around the hull in ways no tide or wind had ever moved water. Under the swells and whorls, sparkling with reflected sunset and moon, pale merse twisted and bobbed like the lilies in my mother's pond. These lilies, however, weren't passive flowers, but sleeping krakens growing in the shallows on thick stalks. Ten meters wide, their thickened, muscular edges were rimmed with black teeth the length of my forearm. We sailed over a garden of clannish, self-cloning monsters. They covered the entire flooded floor of the crater, skulking just below the surface and very defensive of their territory. Only boats that sang the lulling song the merse used to keep peace among themselves could cross these waters unmolested. And now it seemed our tunes were out of date. The young human I knew as Chakas crossed the deck, clutching his palm-frond hat and shaking his head. We stood side by side and stared out over the rail, watching the merse writhe and churn. Chakas-bronze-skinned, practically hairless, and totally unlike the bestial image of humans my tutors had impressed upon me-shook his head in dismay. "They swear they're using the newest songs," he murmured. "We shouldn't move until they figure it out." I eyed the crew on the bow, engaged in whispered argument. "You assured me they were the best," I reminded him. He regarded me with eyes like polished onyx and swept his hand through a thick thatch of black hair that hung in back to his neck, cut perfectly square. "My father knew their fathers." "You trust your father?" I asked. "Of course," he said. "Don't you?" "I haven't seen my real father in three years," I said. "Is that sad, for you?" the young human asked. "He sent me there." I pointed to a bright russet point in the black sky. "To learn discipline." "Shh-shhaa!" The Florian-a smaller variety of human, half Chakas's height scampered from the stern on bare feet to join us. I had never known a species to vary so widely yet maintain such an even level of intelligence. His voice was soft and sweet, and he made delicate signs with his fingers. In his excitement, he spoke too rapidly for me to understand. Chakas interpreted. "He says you need to take off your armor. It's upsetting the merse." At first, this was not a welcome suggestion. Forerunners of all rates wear body-assist armor through much of their lives. The armor protects us both physically and medically. In emergencies, it can suspend a Forerunner until rescue, and even provide nourishment for a time. It allows mature Forerunners to connect to the Domain, from which all Forerunner knowledge can flow. Armor is one of the main reasons that Forerunners live so long. It can also act as friend and advisor. I consulted with my ancilla, the armor's disembodied intelligence and memory-a small bluish figure in the back of my thoughts. "This was anticipated," she told me. "Electrical and magnetic fields, other than those generated by the planet's natural dynamics, drive these organisms into splashing fury. That is why the boat is powered by a primitive steam engine." She assured me that the armor would be of no value to humans, and that at any rate she could guard against its misuse. The rest of the crew watched with interest. I sensed this might be a sore point. The armor would power down, of course, once I removed it. For all our sakes, I would have to go naked, or nearly so. I halfway managed to convince myself this could only enhance the adventure. The Florian set to work weaving me a pair of sandals from reeds used to plug leaks. Of all my father's children, I was the most incorrigible. In itself this was not an ill mark or even unusual. Manipulars of promise often show early rebellion-the stamp in raw metal from which the discipline of a full rate is honed and shaped. But I exceeded even my father's ample patience; I refused to learn and advance along any of the proper Forerunner curves: intensive training, bestowal to my rate, mutation to my next form, and finally, espousal to a nascent triad . . . where I would climb to the zenith of maturity. None of that attracted me. I was more far interested in adventure and the treasures of the past. Historic glory shined so much brighter in my eyes; the present seemed empty. And so at the end of my sixth year, frustrated beyond endurance by my stubbornness, my father traded me to another family, in another part of the galaxy, far from the Orion complex where my peoples were born. For the last three years, the system of eight planets around a minor yellow star-and in particular, the fourth, a dry, reddish desert world called Edom-became my home. Call it exile. I called it escape. I knew my destiny lay elsewhere. When I arrived on Edom, my swap-father, following tradition, equipped my armor with one of his own ancillas to educate me to the ways of my new family. At first I thought this new ancilla would be the most obvious face of my indoctrination-just another shackle in my prison, harsh and unsympathetic. But she soon proved something else entirely, unlike any ancilla I had ever experienced. During my long periods of tutoring and regimented exercise, she drew me out, traced my rough rebellion back to its roots-but also showed me my new world and new family in the clear light of unbiased reason. "You are a Builder sent to live among Miners," she told me. "Miners are rated below Builders, but they are sensible, proud and strong. Miners know the raw, inner ways of worlds. Respect them, and they will treat you well, teach you what they know, and return you to your family with all the discipline and skills a Manipular needs to advance." After two years of generally impeccable service, guiding my reeducation while at the same time relieving my stultifying existence with a certain dry wit, she came to discern a pattern in my questions. Her response was unexpected. The first sign of my ancilla's strange favor was her opening of my swap-family's archives. Ancillas are charged with the maintenance of all records and libraries, to ease access to any information a member of the family might need, however ancient and obscure. "Miners, you know, delve deep. Treasure, as you call it, is frequently in their way. They recover, record, settle the matter with the proper authorities . . . and move on. They are not curious, but their records are sometimes very curious." I spent happy hours studying the old records, and learned much more about Precursor remnants, as well as the archaeology of Forerunner history. Here it was that I picked up hints of lore discouraged or forgotten elsewhere-not always in actual evidence, but deduced from this and that odd fact. And in that next year, my ancilla measured and judged me. One dry and dusty day, as I climbed the gentle slope of Edom's largest volcano, imagining that in the vast caldera was hidden some great secret that would redeem me in the eyes of my family and justify my existence-my common state of pointless fugue-she broke ancilla code in a shocking manner. She confessed that she had once, a thousand years ago, been part of the retinue of the Librarian. Of course, I knew about the greatest Lifeworker of all. I wasn't com pletely ignorant. Lifeworkers-experts on living things and medicine-rank below both Builders and Miners, but just above Warriors. And the highest rank of Lifeworker is Lifeshaper. The Librarian was one of just three Lifeworkers ever honored with that rank. The ancilla's memory of her time with the Librarian had supposedly been expunged when the Librarian's foundation traded her to my swap-family, as part of a general cultural exchange; but now, fully reawakened to her past, it seemed she was prepared to conspire with me. She told me: "There is a world just a few hours' journey from Edom where you might find what you seek. Nine thousand years ago, the Librarian established a research station in this system. It is still a topic of discussion among the Miners, who of course disapprove. Life is ever so much more slippery than rocks and gases." This station was located on the system's third planet, known as Erde-Tyrene: a forsaken place, obscure, sequestered, and both the origin and final repository of the last of a degraded species called human. My ancilla's motives, it seemed, were even more deviant than my own. Every few months, a craft lifted away from Edom to carry supplies downstar to Erde-Tyrene. She did not precisely inform me of what I would find there, but through hints and clues led me to decide it was major. With her help, I made my way through the labyrinthine hallways and tunnels to the shipping platform, smuggled myself onto the cramped craft, reset the codes to conceal my extra mass-and lifted away to Erde-Tyrene. I was now much more than just a rebellious Manipular. I had become a hijacker, a pirate . . . And was astonished at how easy it was! Too easy, perhaps. Still, I could not believe an ancilla would lead a Forerunner into a trap. That was contrary to their design, their programming-everything about their nature. Ancillas serve their masters faithfully at all times. What I could not foretell was that I was not her master, and never had been. I stripped down reluctantly, unwinding the torso spiral, then the shoulder and arm guards, and finally the leg guards and boots. The thin pale fuzz on my arms and legs prickled in the breeze. My neck and ears suddenly itched. Then, everything itched, and I had to force myself to ignore it. The armor assumed a loose mold of my body as it slumped to the deck. I wondered if the ancilla would now go dormant, or whether she would continue with her own inner processes. This was the first time I had been without her guidance in three years. "Good," Chakas said. "The crew will keep it safe for you." "I'm sure they will," I said. Chakas and the little Florian-in their own language, specimens, respectively, of chamanune and hamanune- scrambled to the bow, where they joined the five crew members already there and argued in low whispers. Anything louder and the merse might attack whether or not the boat sang the proper song. Merse hated many things, but they especially hated excess noise. After storms, it was said they were upset for days, and passage over the inland sea became impossible. Chakas returned, shaking his head. "They're going to try pumping out some songs from three moons past," he said. "Merse rarely invent new tunes. It's a kind of cycle." With a sharp lurch, the boat spun about on its mast axis. I dropped to the deck and lay beside my armor. I had paid the humans well. Chakas had heard strange tales of ancient forbidden zones and secret structures within Djamonkin Crater. My researches among the Miners' files had led me to believe there was a decent chance there was real treasure on Erde-Tyrene, perhaps the most sought-after treasure of all, the Organon-the device which could reactivate all Precursor artifacts. It had all seemed to fit together-until now. Where had I been guided wrong? After a jaunt across sixty light-years and a second, trivial journey of a hundred million kilometers, I might never get any closer to my ultimate goal. Merse broke the surface on our starboard side, flexing gray-purple fans and shedding ribbons of water. I could hear long black teeth gnawing at the wooden hull. The journey from Edom to Erde-Tyrene took a long and boring forty-eight hours, entry into slipspace being deemed unnecessary for a routine supply trip across so short a distance. My first live view of the planet, through the open port of the supply craft, revealed a glowing, jewel-like orb of greens and browns and deep blues. Much of the northern hemisphere was lost in cloud and glacier. The third planet was passing through a period of deep cooling and expanding ice floes. Compared with Edom, long past its best eon, Erde-Tyrene was a neglected paradise. Certainly wasted on humans. I queried my ancilla about the truth of their origins. She responded that to the best of Forerunner research, humans had indeed first arisen on Erde-Tyrene, but over fifty thousand years ago had moved their interstellar civilization outward along the galactic arm, perhaps to flee early Forerunner control. Records from those ages were sparse. The supply ship landed at the main research station north of Marontik, the largest human community. The station was automated and empty but for a family of lemurs, who had set up residence in a long-abandoned barracks. It seemed the rest of civilization had forgotten about this place. I was the only Forerunner on the planet, and that was fine with me. I set out on foot across the last stretch of grassland and prairie and arrived at midday on the trash-heaped outskirts of the city. Marontik, located at the confluence of two great rivers, was hardly a city at all by Forerunner standards. Wooden shacks and mud huts, some three or four stories tall, were arranged on either side of alleys branching into other alleys, winding in no particular direction. This crowded collection of primitive hovels spread over dozens of square kilometers. It would have been easy for a young Forerunner to become lost, but my ancilla guided me with unerring skill. I wandered the streets for several hours, a minor curiosity to the inhabitants but no more. I passed a doorway opening to underground passages from which rose noxious smells. Urchins in rags poured up through the door and surrounded me, chanting, "There are parts of Marontik only for the eyes of such a one . . . The dead in review! Ancient queens and kings preserved in rum and honey! They have waited centuries for you!" Though that gave me a vague tingle, I ignored the urchins. They went away after a time, and never did I feel in danger. It seemed these rudely dressed, unkempt, shambling beings had some experience of Forerunners but little respect. This did not bother my ancilla. Here, she said, the genetically impressed rules of the Librarian included docility toward Forerunners, wariness toward strangers, and discretion in all else. The sky over Marontik was frequented by primitive airships of all sizes and colors, some truly horrendous in their pretension-dozens of corded red, green, and blue hot-air balloons tied together, from which hung great platforms of woven river reed, crowded with merchants, travelers, and spectators as well as lower beasts destined, I assumed, to become food. Humans ate meat. The balloon platforms provided a regular, dizzying means of conveyance-and so, of course, my ancilla instructed me to pay for passage to the center of the city. When I pointed out I had no scrip, she guided me to a stash hidden in a nearby substation, hundreds of years old but unmolested by the humans. I waited at an elevated platform and paid the fare to a skeptical agent, who looked over the ancient scrip with disdain. His narrow face and darting, beady eyes were overshadowed by a tall cylindrical hat made of fur. Only after chattering with a colleague hidden in a wicker cage did he accept my payment and allow me to board the next creaking, swaying, lighter-than-air conveyance. The trip took an hour. The balloon platform arrived at city center as night fell. Lanterns were lit throughout the devious streets. Long shadows loomed. I was surrounded by anthropoid rankness. In Marontik's largest market, my ancilla informed me, there had in years past been a collective of human guides, some of whom might still know the routes to the centers of local legend. Soon, the humans would all be asleep-a condition with which I had had little experience-so we had to hurry. "If it's adventure you seek," she said, "here is where you are most likely to find it-yet most likely to survive the experience." In a rambling sloven of alleys, which served both as walkways and gutters, I found the ancient river-stone storefront of the matriarch of guides. Half-hidden in shadows, illuminated by a single candle dangling from a hook in the wattle, an enormously fat female, tented in a loose robe of white fabric, embarrassingly sheer, regarded me with open suspicion. After making a few offers I found offensive, including a tour of underground catacombs filled with human dead, she took the last of my scrip and passed me through a rag-hung arch to a young member of the guild who, she said, might be able to help. "There is treasure on Erde-Tyrene, young Forerunner," she added in a dulcet baritone, "as you have no doubt deduced through careful research. And I have just the boy for you." It was here, in the humid shadows of a reed shack, that I met Chakas. My first impression of the bronze-skinned, half-naked human, with his greasy shock of black hair, was not favorable. He kept looking at me, as if we had met before-or perhaps he was seeking a weak spot in my armor. "I love solving mysteries," Chakas said. "I, too, seek lost treasure. It is my passion! We will be friends, no?" I knew that humans, as lower beings, were deceitful and tricky. Still, I had few choices. My resources were at their limit. A few hours later, he led me through pitch-black streets to another neighborhood, filled with hamanune, and introduced me to his partner, a gray-muzzled Florian. Surrounded by a mob of diminutive youngsters and two stooped, elderly females-I think-the Florian was cheek-stuffing the last of a supper of fruit and plates of pounded, shapeless raw meat. The Florian said that his ancestors had once frequented a ring-shaped island at the center of a great, flooded crater. They called it Djamonkin Augh-Big Man's Water. There, he said, a marvelous site still hid many antiquities. "From the Precursors?" I asked. "Ancient masters," I said. "Before the Forerunners." "Maybe. Very old." The Florian looked me over shrewdly, then patted his lips with the furry back of his hand. Neither Chakas nor the Florian were familiar with that name, but did not dismiss the possibility. The crew separated and opened the hatch on the calliope's box. The hamanune-his head barely level with my waist-waggled his raised hands. With the help of his small, dexterous fingers, they inserted a different wooden placket set with tiny horn pegs, then reset the mechanism of plucked and bowed gut strings, cranked out the horn that broadcast the music into the water, attached the steam tube, and rewound the spring that powered it all. Chakas walked aft, still worried. "Music soothes the savage flowers," the chamanune said, callused finger to lip. "We wait now and watch." The Florian ran back to squat beside us. He looped a hand around his friend's bare ankles. The little man's braincase held less than a third the volume of young Chakas's, and yet I had trouble deciding who was more clever-or more truthful. In my quest for treasure, I had focused my studies on old Forerunner records, and what little I had learned about human history I did not feel comfortable revealing to my guides. Ten thousand years ago, humans had fought a war against Forerunners-and lost. The centers of human civilization had been dismantled and the humans themselves devolved and shattered into many forms, some said as punishment-but more likely because they were a naturally violent species. The Librarian, for some reason, had espoused the human cause. My ancilla explained that either as a form of penance, or at the Librarian's request-the records were vague-the Council had given her charge of Erde-Tyrene and she had moved the last humans there. Under her care, some of the humans had stubbornly reevolved. I couldn't tell whether that might be true or not. They all looked degraded to me. From that seed stock, over nine thousand years, more than twenty varieties of humans had migrated and formed communities around this water-soaked world. Husky ocher and brown k'tamanune wandered the northern latitudes and skirted massive grinding sheets of ice. These dwellers in glacial shadows wrapped themselves in harsh woven fiber and fur. Not far from this inland crater sea, over an imposing range of mountains, skinny, lithe b'ashamanune scampered across equatorial grasslands and leaped into thorny trees to avoid predators. Some chose to build crude cities, as if struggling to reacquire past greatness-and failing miserably. Because of strong similarities in our natural genetic structure, some Forerunner sages thought humans might be a brethren species, also shaped and given breath by the Precursors. It was possible the Librarian was intent on testing those theories. Very shortly, evolved or not, there might soon be seven fewer humans in the Librarian's collection-and one less Forerunner. We sat near the widest spot in the deck, away from the low rail. Chakas formed his fingers into a cradle, then swapped them in an exercise he adamantly refused to teach me. His wry smile was so like that of a Forerunner child. The little Florian watched us with some amusement. our boat were laughably simple, little more advanced than the comb jellies that swam in the glassy walls of my swap-father's palace, on that russet spot a hundred million kilometers away. And yet, they sang to each other-spoke in soft, musical murmurs through the long nights, then basked silent in the dappled sun as if sleeping. On rare occasions, the crater ocean roiled with brief sea-merse wars, and shreds of glistening flesh washed up on far beaches for weeks. . . .
could judge. The Librarian might have had a hand in bringing them to Erde-Tyrene-to grow in Djamonkin Crater, where they also served her ends, perhaps by solving biological riddles in their own strange way, using their own genetic songs. . . .
Was I imagining it, or was the grinding beneath and the churn around us slowly subsiding? The moon set. The stars were thick for a time. Then fog rolled back in, filling the crater bowl from brim to brim. Chakas claimed he heard the gentle lap of waves on a beach. "The merse are quiet now, I think," he added hopefully. I got up to retrieve my armor, but a bulky, strong-looking human blocked my way, and Chakas shook his head. The crew decided it might be time to drop the screw and engage the engine. Again we made forward progress. I couldn't see much beyond the rail except little bursts of phosphorescence. The water, what little I could see of it, appeared calm. Chakas and the Florian murmured human prayers. The Florian ended his prayers with a short, sweet melody, like birdsong. Had I been faithful to my upbringing, I would even now be contemplating the dictates of the Mantle, silently repeating the Twelve Laws of Making and Moving, allowing my muscles to flex according to those rhythms until I swayed like a sapling. . . . But here I was, following false hopes, associating with the discredited and the low . . . And I might yet swim in a toothy sea, my undeveloped body shredded by mindless monsters. Or walk on a deserted beach around a sacred island in the middle of an old asteroid crater, flooded ages ago with cold water so pure it dried without residue. Challenge, mystery, unbridled danger and beauty. It was all worth whatever shame I might be wise enough to feel. As a Manipular, I still resembled Chakas more than my father. I could still smile but thought it beneath me. Despite everything, in my thoughts I could not help visualizing myself as taller, broader, stronger-like my father, with his long, pale face, crown hair and nape fur bleached white with lilac roots, fingers capable of surrounding a shrop melon . . . and strong enough to smash its tough shell to pulp. This was my contradiction: I mistrusted everything about my family and my people, yet still dreamed of mutating into a second-form-while keeping my youthful, independent attitude. Of course, it never seemed to happen that way. The pilot strode aft with renewed confidence. "The merse think we're one of them. We should reach the ring island in less than a flare." Humans counted time using waxy wicks tied with knots that flared when touched by an ascending flame. Even now, two of the crew were lighting lanterns with crude sticks. In the fog, something big bumped the bow. I caught myself in mid-lurch and steadied against a wide, slow swing of the stern. Chakas jumped to his feet, grinning ear-to-ear. "That's our beach," he said. The crew dropped a board onto the black sand. The Florian scampered ashore first. He danced on the beach and snapped his fingers. Again I tried to retrieve my armor, and again the bulky crewmember blocked my way. Two others approached slowly, hands out, and guided me toward Chakas. He shrugged at my concern. "They fear that even from the beach, it might anger the merse." I had little choice. They could kill me now, or I might die from some other cause later. We crossed the ramp through the fog. The crew stayed on the boat-and so did my armor. As soon as we were disembarked, the boat backed water, swung about, and left us in the drizzle and darkness with nothing but three small bags of provisions-human food only, though edible enough if I held my nose. "They'll be back in three days," Chakas said. "Plenty of time to search the island." When the boat was gone and we could no longer hear the chugging pump of its song, the Florian danced some more. Clearly, he was ecstatic to walk once again on the ring island of Djamonkin Augh. "Island hides all!" he said, then chittered a rolling laugh and pointed at Chakas. "Boy knows nothing. Look for treasure and die, unless you go where I go." The Florian pushed out expressive rose-colored lips and raised his hands above his head, thumb and forefinger circled. Chakas seemed unaffected by the Florian's judgment. "He's right. I know nothing about this place." I was too relieved to have escaped the merse to feel much irritation. I had known humans could not be trusted; they were degraded forms, no doubt about it. But something felt authentically strange about this beach, this island. . . . My hopes refused to wink out. We walked inland a few meters and sat on a rock, shivering in the damp and cold. "First, tell us why you're really here," Chakas said. "Tell us about Forerunners and Precursors." In the dark, I could see nothing above the palms, and beyond the beach, nothing other than a faint glow from the breaking wavelets. "Precursors were powerful. They drew lines across many skies. Some say that long ago they shaped Forerunners in their image." Even the name we gave ourselves, "Forerunner," implied a fleeting, impermanent place in the Mantle- accepting that we were but a stage in the stewardship of Living Time. That others would come after us. Other-and better. "And us?" the Florian asked. "Hamanune and chamanune?" I shook my head, unwilling to encourage this story-or believe it. "how we might have offended them . . . and just possibly find the center of their power, their might, their intelligence." "Oh," Chakas said. "Are you here to discover a great gift and please your father?" "Something to prove you're not a fool. Hm." Chakas opened the bag and handed out small rolls of dense, black bread made with fish oil. I ate but enjoyed none of it. All my life, others had judged me to be a fool, but it stung when degraded animals reached the same conclusion. I flicked a pebble toward the darkness. "When do we start looking?" "Too dark. First, start a fire," the Florian insisted. We gathered branches and half-decayed palm chunks and built a fire. Chakas seemed to doze off. Then he awoke and grinned at me. He yawned and stretched and looked out over the ocean. "Forerunners never sleep," he observed. That was true enough-as long as we wore armor. "Nights are long for you, no?" the Florian asked. He had rolled his fish-oil bread into round little balls and placed them in lines on the smoothness of a glassy black rock. Now he plucked them up and, one by one, popped them into his mouth, smacking his broad lips. "Better that way?" I asked. He made a face. "Fish bread stinks," he replied. "Fruit flour is best." The fog had lifted but overcast still lay over the entire crater. Dawn was not long off. I lay on my back and looked up at the graying sky, at peace for the first time I could remember. I was a fool, I had betrayed my Maniple, but I was at peace. I was doing what I had always dreamed I would do. "Daowa-maad," I said. Both humans lifted their eyebrows-it made them look like brothers. Daowa-maad was a human term for the roll and tug of the universe. It actually translated rather neatly into Forerunner Builder-speak: "You fall as your stresses crack you." "You know about that?" Chakas asked. "That's the voice in his clothes," Chakas told the Florian, all-wise. "A female." "Is she pretty?" the little one asked. "Not your type," I said. The Florian finished the last rounded ball of fish-oil bread and made another remarkable face. So many expressive muscles. "Daowa-maad. We hunt, we grow, we live. Life is simple-we do." He poked Chakas. "I begin to like this Forerunner. Tell him all of my names." Chakas took a deep breath. "The hamanune sitting right next to you, whose breath smells of fish oil and stale bread, his family name is Day-Chaser. His personal name is Morning Riser. His long name is Day-Chaser Makes Paths Long-stretch Morning Riser. Long name for a short fellow. He likes to be called Riser. There. It is done." "All good, all true," Riser said, satisfied. "My grandfathers built walls here to protect and guide us." "You will see after sunup. Now-too dark. Good time to learn names. What's your real name, young Forerunner?" For a Forerunner to reveal his actual using name to anyone outside the Maniple . . . and to humans, at that . . . Delicious. A perfect thumb-crook to my family. "Bornstellar," I said. "Bornstellar Makes Eternal Lasting, Form Zero, Manipular untried." "A mouthful," Riser said. He opened his eyes wide, leaned in, and made that full-mouth, lip-curled, leering grin that indicated vast Florian amusement. "But it has a good rolling sound." I leaned back. I was getting more and more used to his fast, piping speech. "My mother calls me Born," I said. "Short better," Riser said. "Born it is." "Day is coming. Warmer soon, and bright," Chakas said. "Shuffle and scuff. Don't want anyone to find tracks." I suspected that if anyone from Edom was searching for me, or if the Librarian's watchers decided to check from orbit, from a drone, or with a direct flyover, they would find us no matter how we hid our tracks. I didn't say anything to my companions, however. In my short time on Erde-Tyrene I had already learned an important truth-that among the poor, the downtrodden, and the desperate, foolish bravery is to be savored. I was obviously foolish, but, apparently, my two companions now believed I might be brave. We swept away our tracks using a palm frond from the shoreline vegetation. "How far to the center of the island?" I asked. "Long legs, shorter trip," Riser said. "Fruit along the way. Don't eat. Gives you the scoots. Save it all for me." "It'll be fine," Chakas confided to me. "If he leaves any for us." "We're not going to the mountain," Riser said. He pushed through the vegetation. "No need to cross inner lake. A maze, some fog, a spiral, then a jump or two. My grandfather used to live here, before there was water." Curiouser and curiouser. I knew for a fact-again, from my ancilla-that the crater had been flooded and the lake planted with merse a thousand years ago. "How old are you?" I asked. Riser said, "Two hundred years." "For his people, just a youngster," Chakas said, then made a clicking sound with tongue and cheeks. "Little folk, long lives, longer memories." The Florian whickered. "My family grew up on islands everywhere. We made walls. My mother came from here before she met my father, and she told him, and he told me, click-song and stare-whistle. That's how we'll know the maze." "You are privileged," Chakas said. "Hamanune do not often reveal these truths to outsiders." "If they are true," I said. Neither took offense. The humans I had met seemed remarkably thick-skinned. Or more likely, the pronouncements of a Forerunner meant little on a world they thought was theirs. Daylight finally arrived, and swiftly. The sky went from mellow orange to pink to blue in a few minutes. From the short jungle came no sound, not even the rustling of leaves. I had experienced few islands in my short existence, but had never known any of them to be as quiet as a tomb. 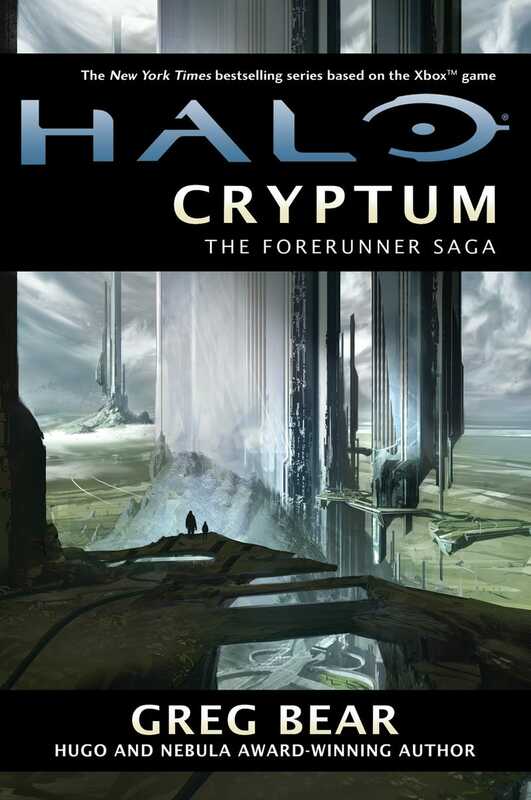 Halo: Cryptum is on sale now at Amazon and other book sellers. Greg Bear is the author of more than thirty books of science fiction and fantasy, including HALO: CRYPTUM, MARIPOSA, DARWIN'S RADIO, CITY AT THE END OF TIME, EON, HULL ZERO THREE and QUANTICO.